While checking in to a hotel on a recent trip, bank employee Wang Liming, 29, suddenly realized she was not carrying her identity card. Development of the data center and software clouding system by Huawei Technologies Co Ltd in Guian New Area, Southwest China's Guizhou province, is going smoothly, according to a statement made by the Big Data Development Administration of Guizhou province on April 3. The rattan-weaving technique of Dalou Mountain originated in Guizhou province in the 1960s. It was included in the Zunyi Intangible Cultural Heritage List in 2006. The base, located in Zheng'an county of Guizhou province, has a cultivated area of 1000 mu (66.67 hectares). 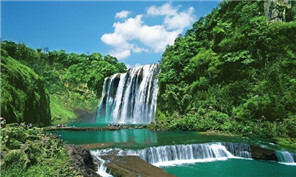 In recent years, Guizhou has been making good use of its abundant tourism resources to attract more travelers. Tongren, a city in Guizhou province, plans to become a global center for matcha production, as its subtropical climate and unpolluted clean air are ideal for growing high-quality tea. Maotai No 1 Primary School in Renhuai city of Southwest China's Guizhou province was named the Red Army Primary School in honor of the First Front Army of the Chinese Workers' and Peasants' Red Army on March 26.